Ever since I gave birth to Major, I started noticing some melasma spots on my face. I had a big spattering down the center of my forehead and a bit on each cheekbone. For people who don’t know, Melasma is a skin condition often brought on by hormones (this is why pregnancy is a big culprit) that causes darkened skin spots. The spots are often grouped in smatterings across different areas of the face, and are brought out and aggravated by heat and sunlight. 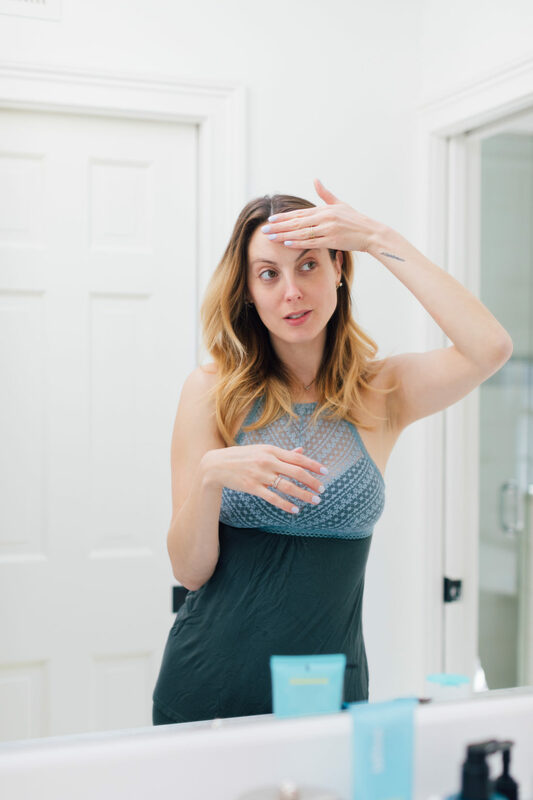 I didn’t get melasma during my pregnancy with Marlowe at all, and I hadn’t noticed the melasma during my pregnancy with Major– though I’ll admit I wasn’t as religious about sun protection during my pregnancy with him as I had been with my first. Maybe it was the distraction of the toddler hanging off of me the entire time. LOL. I’ve been lucky enough to be privy to tons of great skincare over the last few years, and after I stopped breastfeeding I started aggressively targeting the melasma with skincare. I tried various product approaches, and my melasma spots did lighten, but they didn’t go away as much as I wanted them to– and they really started affecting my self confidence. I don’t like feeling like I “need” to wear makeup, but my melasma started making me insecure about how my skin looked without makeup, and I started feeling myself getting to a place like I had in my acne phase years ago where I just didn’t feel secure in my own skin. Literally. And no matter how much I tried to put this issue in perspective (hello, World Hunger! Poverty! Homelessness! Cancer! ), the honest truth is that my melasma was really starting to bother me and effect how I felt about myself daily. I could even see it THROUGH makeup if I was really looking for it. After trying for about nine months to fade it with products alone, I decided to really do my research and see if there was a way to get more aggressive with my melasma treatment. And that’s how I found IPL therapy! When I had been looking at melasma treatments, a lot of people had recommended a really intense face peel that would essentially re-surface my skin. The only (big) problem? Serious downtime. Facial peeling, No photos possible! And I haven’t even taken more than five days off of the blog in over a year…that didn’t seem like a realistic possibility. When I went in for a consultation to get my lipoma removed, the plastic surgeon told me that IPL therapy would be a great option for me. 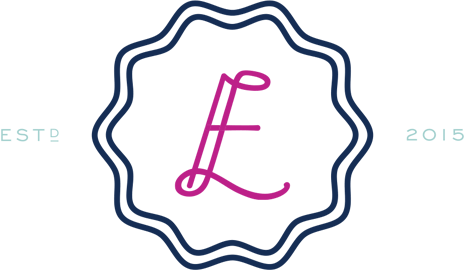 IPL stands for Intense Pulse Light, and is is a technology used by cosmetic and medical practitioners to perform various skin treatments for aesthetic and therapeutic purposes, including hair removal, treatment of skin pigmentation, sun damage, and thread veins. The multi-spectrum light targets melanin specifically, and can fade discoloration in as little as one treatment. Some women I spoke to said they needed two treatments to fully fade their melasma spots. When I went in for my IPL consultation, they told me that they recommend maintaining great skin by getting an IPL treatment 1-2 times a year to really combat aging and keep skin looking flawless. My experience with IPL was so quick and simple. In about thirty minutes, my technician went over my skin and pulsed the light little by little over my entire face and décolleté. Each time, it felt like a rubber band snapping against my skin and was accompanied by a very bright flash of light. It’s by no means painless, but it wasn’t excruciating either. When I left the treatment, my spots were darker than they had been (which I had been told would happen), and two days later they were at their darkest. Then, over the next week they slowly flaked off and faded. It’s been a few weeks now since my treatment, and my skin is looking so much better! My melasma is so very faintly still there, but I can barely see it! I may get a follow up treatment before Summer to make it go away 100%. The important thing is I feel SO much better about my skin! And it looks brighter and clearer than ever. 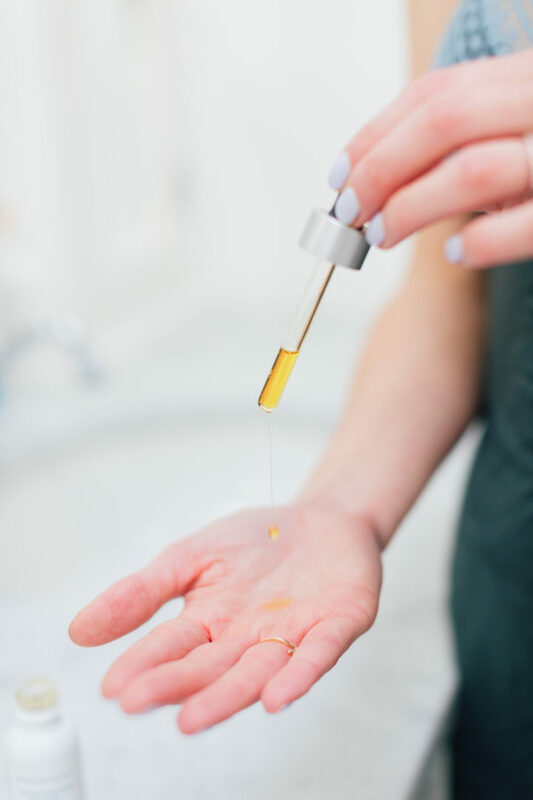 In order to prevent any more discoloration and skin spots, and to work to fade any lasting remnants of melasma, I’ve been following a strict skin protocol that I’ve been loving. I thought I would share it today in case anyone else needs some help with their skin discoloration! 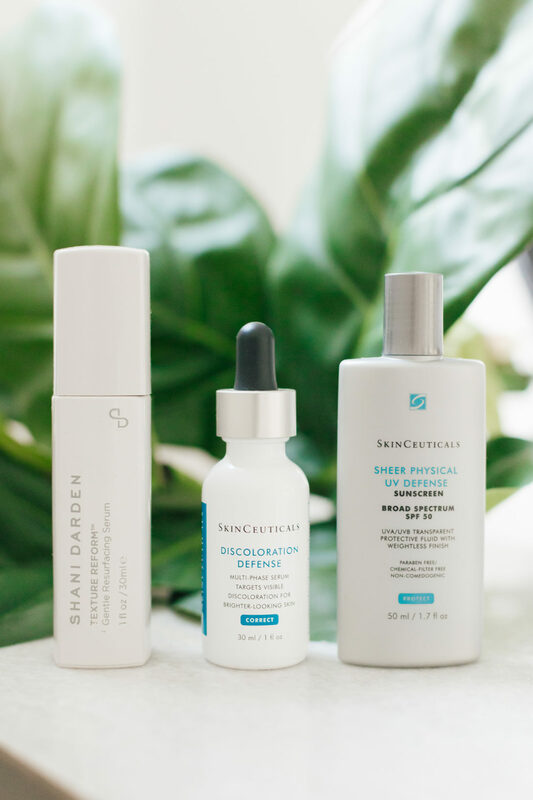 My three hero products have been Skinceuticals Discoloration Defense, SkinCeuticals Sheer Physical UV Defense, and Shani Darden Texture Reform. Every morning, I place 4-5 drops of Discoloration Defense in my palms and press it over my clean, bare skin. I follow it with the Sheer Physical UV Defense to protect against additional sun spots. I also make sure to wear a hat if I know I’m going to be in direct sunlight for longer periods of time. At night, after cleansing, I alternate nights between applying Discoloration Defense, and Texture Reform. I follow with a light moisturizer and eye cream! I am wearing zero makeup in these pictures, so you can really see my progress! Do you have any melasma fighting must haves? Please share in the comments below! I get melasma REALLY bad, each pregnancy it’s gotten progressively worse and this time around it’s so bad, it has me massively depressed…thank you for sharing I may look into IPL again. 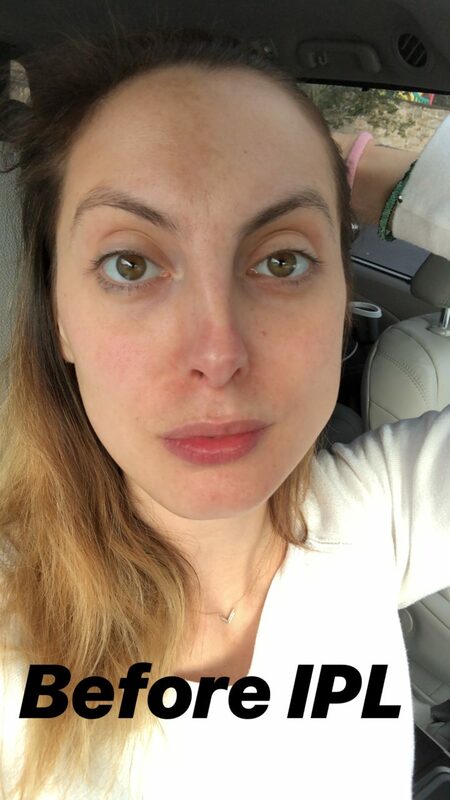 After I was done nursing my son this past spring I went into a med spa to get a plan together and they told me IPL runs a risk of making it worse since it uses heat to treat it and they recommended microneedling…I barely saw any change and so I felt really defeated. The only other product that has really helped me was R+F reverse but we were doing IvF in a month and I knew that wasn’t enough time to tackle it. Any other followers have the same experience? I’m terrified of it getting worse! I’m trying to find something to help fade my melasma!! I hate it!!! Thank you for sharing! I just had my first IPL treatment and I’m hoping for good results. How many treatments did you do? Eva, do you mind sharing where you got the IPL treatment? I’m local and have some melasma from my last pregnancy still- Would love the rec! I am currently 32 weeks pregnant. I, again, got the skin darkening issue. When I was pregnant with my daughter it seemed to only show up on the backs of my legs. It almost looked like I sat in a dark brown paint. This time it’s in my underarms, patchy on my stomach and chest, and again on my legs. Has not appeared on my face … yet. It does make me slightly self conscious when I’m not in long sleeves! Luckily due to the cold weather I’ve been able to hide it.